Editor’s Note: An earlier version of this article incorrectly listed the kickoff day as Friday, May 25 instead of Saturday May 26. Philadelphia Union are riding high right now, having won three of their last five games including both of their last two. With Borek Dockal seemingly finding his form, fans are finding hope for future matches. But the Union kick off their Memorial Day weekend with a Saturday night away match against a much tougher New York Red Bulls side. 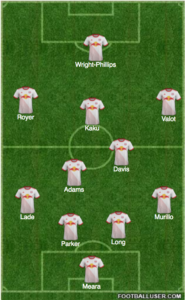 New York Red Bulls might be the toughest opponent the Union have faced this season because New York Red Bulls might be the best team in MLS. While the Union have won their last two, Red Bulls are on a four game winning streak, having beaten the top two teams in the Eastern Conference in NYC FC and Atlanta United. brought his goal average to 0.8 per game, and he’s tied for most in the league. Stopping him might not be possible for the young Union backline, and Andre Blake will undoubtedly have to pull out some #SavesByDre. Jesse Marsch has become one of the premier managers in MLS, and you can be sure he will come with a game plan to unbalance the Union’s attack and pressure the young back line. With injuries to Tyler Adams and Kemar Lawrence, his game plan might have had a wrench thrown into it, but he revealed that they will both most likely be in the game. Again, Philadelphia Union are feeling about as good as they can right now, winning their last two games – one of them an away match. nternational no. 10 Borek Dockal seems to have found the form Union fans were looking for, and Jim Curtin has made some adjustments to the roster that look to have helped the squad out, keeping David Accam on the bench as a super sub and switching out young center back Jack Elliott for much younger center back Mark McKenzie. to see how he starts out, as he still looked to be coping with the injury a bit against Real Salt Lake. A win isn’t impossible, but the Union will need to capitalize on every opportunity they’re given to make it happen. The Czech no. 10 has done well the past two games, but the biggest question for the Union’s success is “can he do it consistently?”. The idea that he came to the team late and just needed time to adapt before become an elite playmaker is a nice narrative. It may even be the correct one. This match will help us find out. Take any kind of win streaks away. Take scoring records away. On paper and on the field, the Red Bulls are just a better team. Bradley Wright-Phillips may be the best pure goal scorer in MLS, and Jesse Marsch can put a match plan together like no other. The Union have great pieces and great promise, but they’re not at Red Bulls’ level yet. Now add the records back in. Philadelphia Union have a two game win streak, with one away win in the past year. New York Red Bulls have a four game win streak with a combined three losses at home between last season and this season. It’s not going to be great for the Union, but we can use it as a litmus test for how our young line takes on elite offenses. Might be a game to consider bringing Elliot back into the lineup since the Cows high press and he has faced them before so would hopefully not be as rattled. Agree. But there is no way Curtin will mess with a winning lineup (unless forced to by injury). The historical record does show that he handed Auston Trusty the keys to left center back last January. Fullest credit goes to Trusty for seizing the opportunity. But credit Curtin’s judgment as well. My own guess would be he prefers McKenzie’s pace to Elliott’s height, given that NYRB are pacey. That Kemar Lawrence is well enough to not be listed as “out” is excellent news. His injury looked as though it had the potential to be horrific. By eyeball through the television he was out cold on the ground from something that should not necessarily have knocked him out. Relieved that he is not hurt worse, even if he plays for Red Bulls. Red Bull is the team we want to be when we grow up. Well coached, fantastic academy, results with a low wage bill. MLS results are always tough, but I think a Red Bull win is money in the bank. Include transfer fees and their low wage isn’t as low as it first appears. Not that they are crazy spenders, but they spend more than we do for sure. Full agreement, honestly as much as I hate RB, they play some of the most exciting soccer in the league. I really wanted Simpson to be our BWP, because the goals BWP scores aren’t only plentiful but beautiful as well.